Podiatry done differently means we put the patient first and approach each person with compassion and care. Dr. Miller was born and raised in Northeast Oklahoma. Upon completing his undergraduate studies at Northeastern State University in Tahlequah, Oklahoma, he chose to pursue a career in medicine and moved to Chicago, IL. There he attended William M. Scholl College of Podiatric Medicine at Rosalind Franklin University of Medicine and Sciences, and graduated in 2007. After graduation Dr. Miller entered into a dual 3-year residency program at The Cleveland Clinic in Cleveland, OH and at the Surgical Hospital of Oklahoma in Oklahoma City, OK. The Cleveland Clinic focused on medical training, while the Surgical Hospital of Oklahoma focused on surgical training. Training at the two clinics provided Dr. Carl Miller the unique opportunity to establish a strong clinical and surgical foundation..
Dr. Miller received a full scholarship from the Indian Health Services, and subsequently started his career in Claremore, OK at the Claremore Indian Hospital. Dr, Miller was a member of the medical staff at the Claremore Indian Hospital for 2 years. Working at the Claremore Indian Hospital led to an opportunity to join the staff at Muscogee Creek Nation Health. 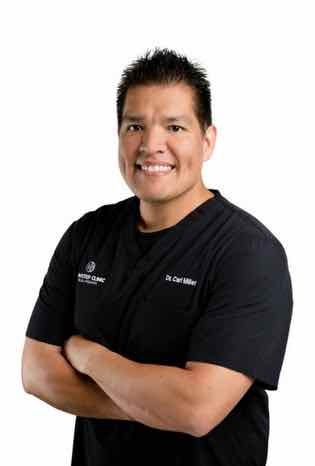 Dr. Miller was on staff as a podiatrist with the Muscogee Creek Nation for four years. His time providing care to the Native American population exposed him to a challenging patient population, and pathologies, such as: traumatic injuries, adult and pediatric deformities, diabetic wounds and infection, and sports injuries. Dr. Miller utilizes a conservative approach when needed or desired. Dr. Miller's top priority is giving the best treatment for each individual patient. Dr. Miller recognizes that foot and ankle care is just one part of each patient's overall wellness, and considers the whole person when treating his patients.